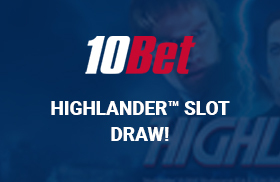 10Bet offers its players an opportunity to unleash the heroic power of the one immortal Scot on its brand new slot game – Highlander™. The game is being launched with promotional bonuses, which have been running since 6th and will be ending on 20th December. The players stand a chance to get a share of a £40,000 reward from the 15 Cash Drops and its Grand Prize Draw. To get the 10Bet bonus rewards, a player has to log into the casino and play the new Highlander™ to enter the Cash Drop and finally the Main Draw. Throughout the Microgaming network, 332 lucky players will be drawn to each win cash prizes. The main draw will be on the 21st December and will include 1x £10,000, 2x £2,000, 3x £1,000 and 6x £500 cash prizes. The other cash prizes will be won on Cash Drops on different dates starting 7th to 21st December. For a player to be able to win, they will have to play a minimum of 10 bets on Highlander™. A player can make only one entry and bet on any amount. The players must wager a minimum of £25 from their cash accounts for them to be able to enter the Main Draw. All the cash prizes have no wagering requirements and are withdrawable. The prizes will be credited to the Customer’s Cash Account. The Winners might be required to pay taxes on any prize won. This will be in accordance with the customer`s jurisdiction’s tax legislation.